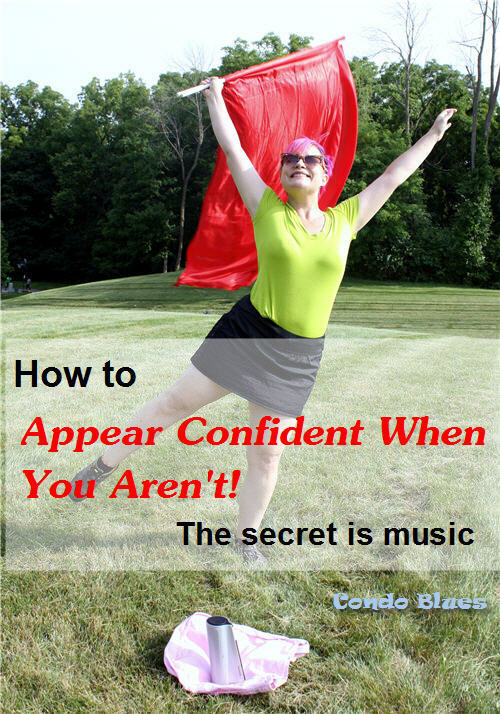 When I need a boost of confidence or a push out of my comfort zone in an unfamiliar situation music is my secret weapon. For example, a power ballad running through my head is all I need to change my mindset and body language to become a confident pack leader in a dog training situation. 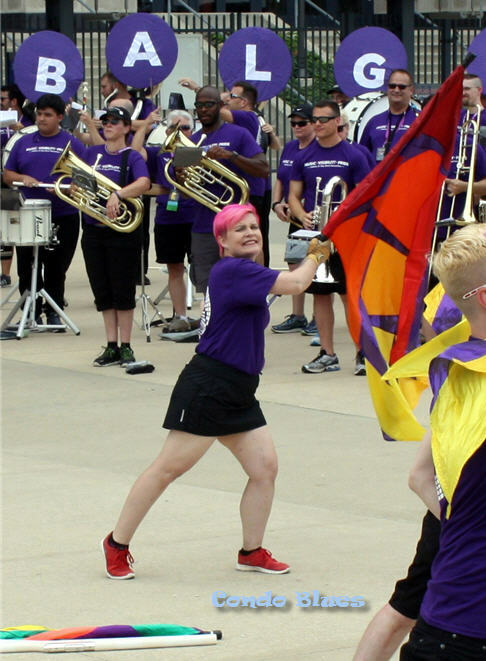 When I doubted my ability to relearn how to play my high school instrument, my community band mates pushed me to try playing what I can and wouldn't let me give up on myself. Many of them are teachers and it just goes to show teachers never turn Teacher Mode off. Thank you teacher friends! Spinning double swing flag routine makes me feel like I'm flying.
! 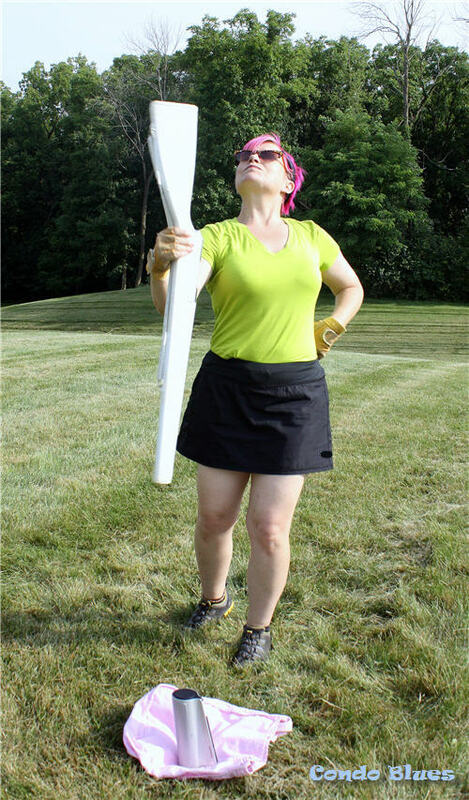 I'll teach you how to make swing flags in a later post. I am attending a band conference this summer. We are being asked to perform for students to let them know they don’t have to give up playing when they graduate. Pulling off two shows of 15 to 18 songs each with 200 people from member bands in 19 states with only two days of rehearsal is no small feat. We wow our audiences every time. Having a few music teachers and professionals playing helps, but the secret to our success is technology. 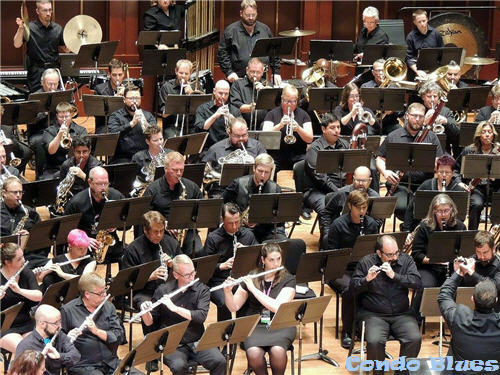 Update 8/11/15: A friend saw this concert band photo and commented "It's not hard to spot our Lisa in the band." It is a privilege to play with such a talented group! The conference emails us links to our sheet music, color guard instructional videos, and MP3s of the music. It our responsibility to learn the work at home before we meet in person to clean it. Rehearsing to MP3s with a good external speaker like the Lenovo™ 500 Bluetooth® Speaker is a must, especially for the color guard routines. Ear buds will get tangled and yanked out of ears when rehearsing tosses and car speakers for group rehearsals muffle the sound. This is clearly a no headphone zone! Lenovo™ 500 Bluetooth® Speaker is a musician’s, educator's, and performers best friend! It found my devices easily using its CSR 4.0 Bluetooth® technology. The Lenovo™ 500 Bluetooth® Speaker also supports NFC (Near Field Connectivity) if you need it. Fully charged and unplugged the Lenovo™ 500 Bluetooth® Speaker’s rechargeable 100 mhA battery has up to four hours of playback time although for the sake of my family and neighbors my flute practice sessions haven’t been that long! The time signatures in several pieces change every other bar. I am relying on playing to the music in a big way! I really appreciate that the Lenovo™ 500 Bluetooth® Speaker can go anywhere and everywhere I need to go because it weights in at a mere 1.6 pounds. I’m no longer tethered to practicing rifle quads in my tiny front yard. 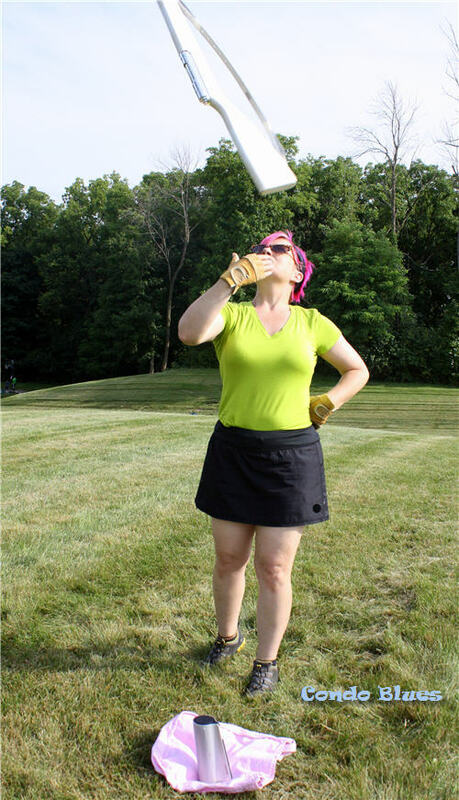 This summer the Lenovo™ 500 Bluetooth® Speaker has allowed me to easily take all of my equipment and rehearse in the big public green spaces in our neighborhood to Husband’s surprise. One handed catch? LIKE A BOSS! When he called looking for me because I got the call on the Lenovo™ 500 Bluetooth® Speaker down the street because it can go from playing music into a speakerphone for making calls. Pretty slick! All of these features make the Lenovo™ 500 Bluetooth® Speaker a cool little gadget but for me, what makes it a serious must have is the incredible sound that comes out of this tiny portable speaker! The Lenovo™ 500 Bluetooth® Speaker’s 270-degree sound experience blows the doors off my old tinny and muddy sounding speaker. I tried making a video comparing the sound on the two but my camera microphone doesn't do the clarity of the Lenovo justice. 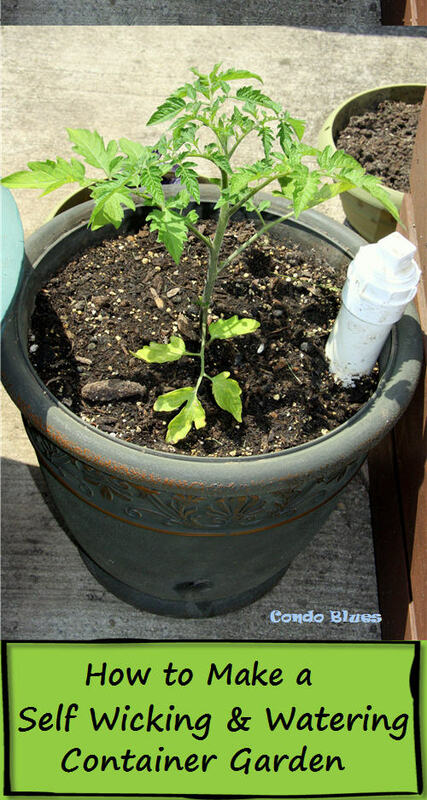 Instead, I'll let you experience the Lenovo™ 500 Bluetooth® Speaker at home with a giveaway! Lenovo™ 500 Bluetooth® Speaker Giveaway! I want you to experience how the sound quality of the Lenovo 500 Bluetooth Speaker has changed my life and am giving one away on Condo Blues! 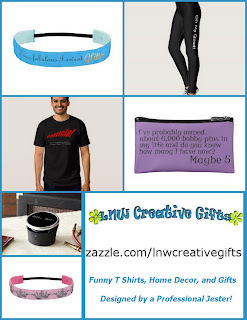 Enter to Win using the Rafflecopter widget below! 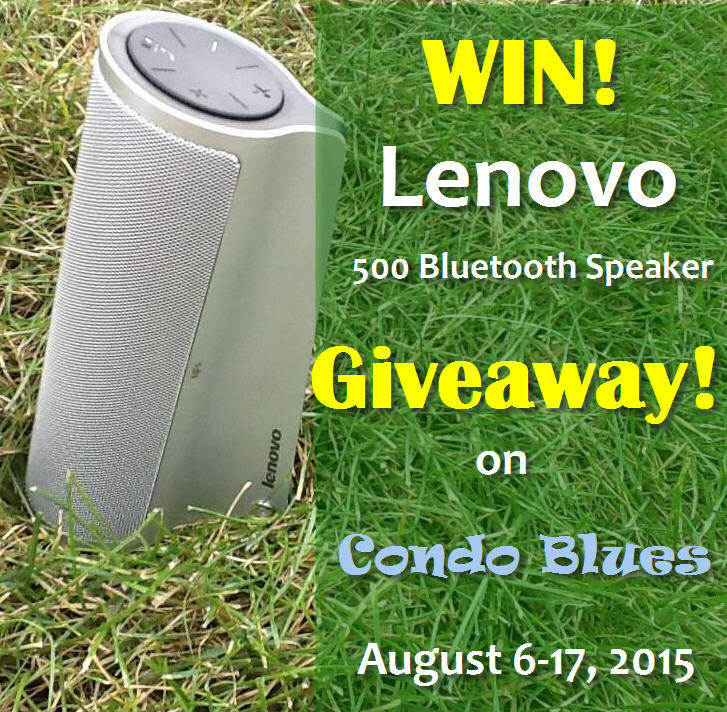 The Lenovo™ 500 Bluetooth® Speaker Giveaway runs from August 6 – 17, 2015. I will use a random number generator to select the winner. Good luck!